Thu, 4.23.2015. If you're a collector, you know that the process can be like young love: there is a symbolic meeting of the eyes and... you gotta have it. Sometimes this reunion with the unmet friend is facilitated by a matchmaker--a savvy dealer who knows both his merchandise and his clientele, a trader who tells a great story. In the case of these beads, our matchmaker was a gaunt stranger who showed up for a number of years at the local Coin & Stamp Show. His booth was always near the front door and we rarely got past him without emptying our bank accounts for a story. He'd "just come from China," he would tell us, where he traveled deep into the countryside to find some unique treasures. Their stories were told on tiny tags, with just the right words to seduce us. 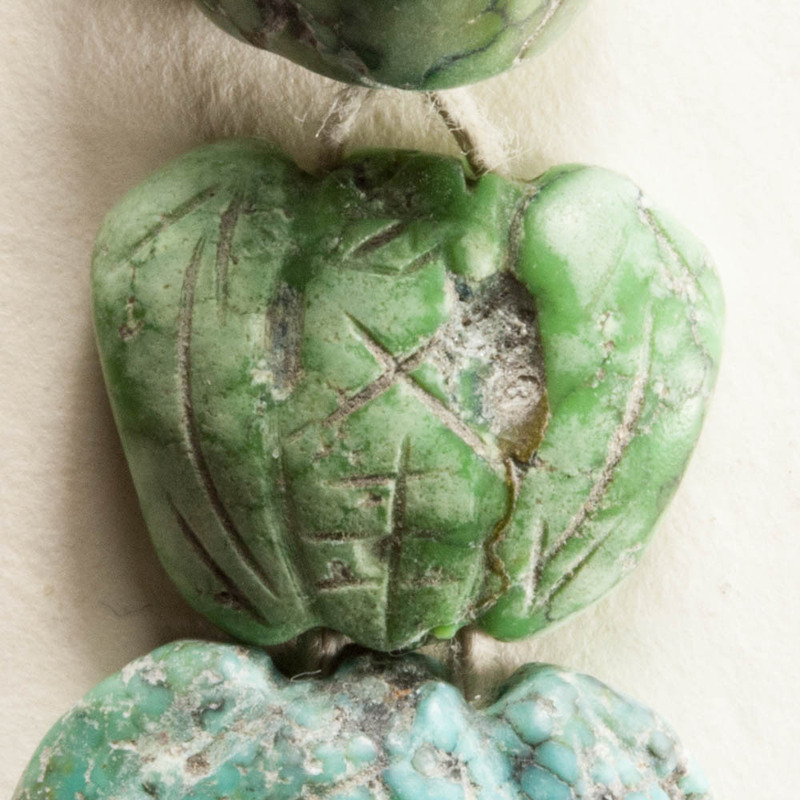 Take this strand of carved turquoise beads. Below is the tag, front and back. I blotted out the price for sheer embarrassment at what we paid for them. 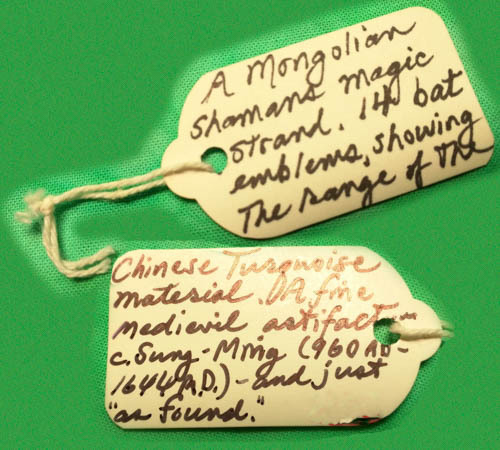 But who can resist "Mongolian shamans magic"... "medieval artifact"... "as found"? Not us! I took them out recently to study, to have a "date night" with magic beads. Under magnification, they do have the gritty signs of burial. And I got fascinated by the inscribed design. Were they archaic Chinese characters, stylized bat designs, or some combo of the two? But Mongols didn't write in Chinese, did they? 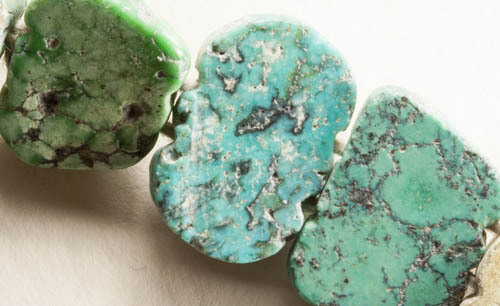 The double-drilled beads do show a lovely range of turquoise, especially notable from the smooth backs (see below). But what about the rest of the story? I can't find any leads on the internet. I have a book on Mongol jewelry and, yes, they use turquoise, but it is highly refined. 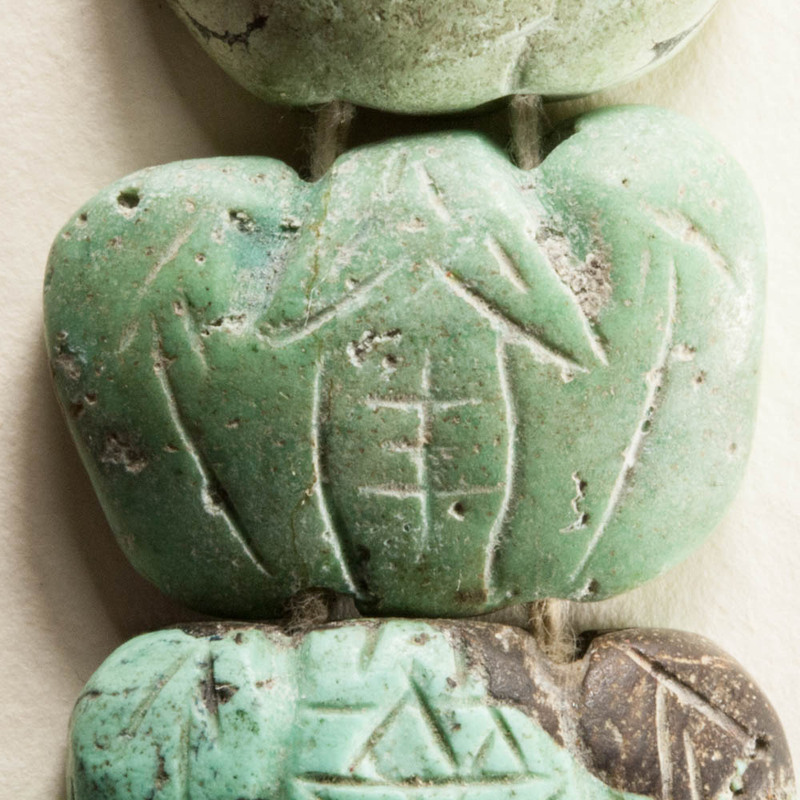 Nowhere can I find images of little bat amulets like these. There are indeed shamans among the nomadic Mongols of Mongolia and southern Siberia. They wear gigantic robes hung with all manner of power objects... but turquoise bats? No can find. So did our itinerant merchant know what he was talking about? Did he really turn up objects so unique that not even Google knows about them? Or was he master of the romance? "Romanced"--that's my new term for being swept off my feet by a trader with a good story, who makes me fall in love with something, no matter if it is false. In the end, of course, all we have are the stories. Bats are a Chinese symbol for happiness especially in regards to marriage. Mongolians do not have this symbolism. Mongolian shamans usually wear ornaments made of bronze or bone. The Chinese word for bat sounds like the Chinese word for happiness. Your beads probably date to 1880-1930. 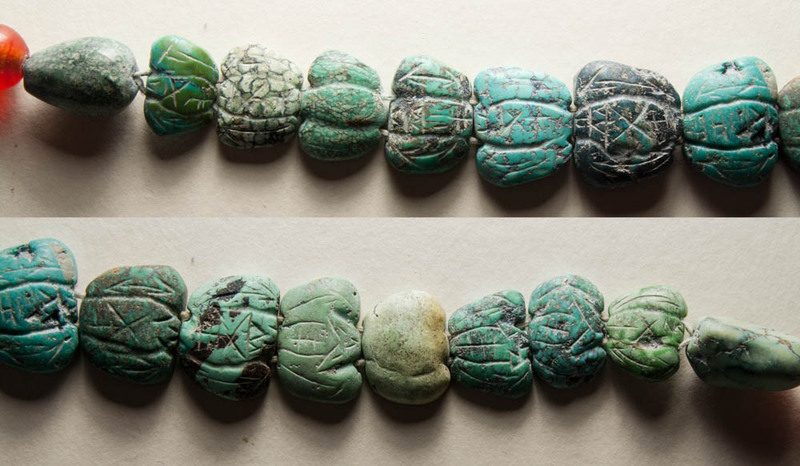 So these beads world have been worn by a Chinese woman or child, not a Mongolian man.